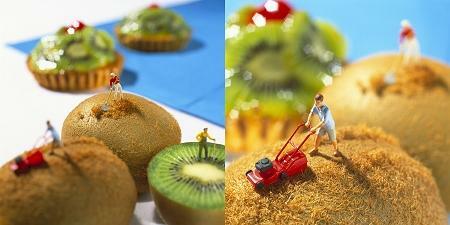 Akiko Ida and Pierre Javelle (a French pastry chef/arts photography team) create landscapes out of food: mushrooms, kiwis, salads, ice cream, watermelons, cakes. 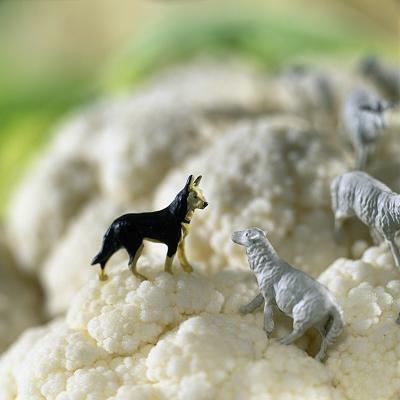 Cauliflower, even. 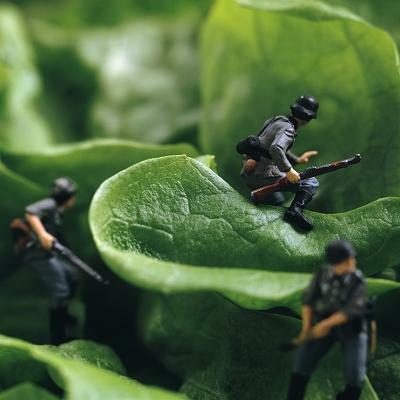 [Image: Escargot (in a different photograph, there is a large snail creeping through the salad)]. [Image: Mouton (aka Le prédateur)]. Gastronomic landscapes, or gastronomescapism, perhaps. For those curious, of course, there’s more to be read at the Galerie Fraîch’Attitude (in French); and, if you have a lot of patience and a high tolerance for slow and completely unnecessary Flash, then you can visit their own website for some more images – some really, really great images – making all the frustrating Flash b.s. almost worthwhile. [Image: Pastèque (aka Les épépineurs)]. I love this, especially the watermelon one. Small-scale sculpture gets no respect, unless it’s jewelry or maybe the atomic-level sculpture that nanotechnologists make, and even that is just because it’s novel. This guy carves sculptures into the lead of a pencil, while it’s still attached to the pencil. His site says the sculptures take years to complete — good lord, seriously? very creative! 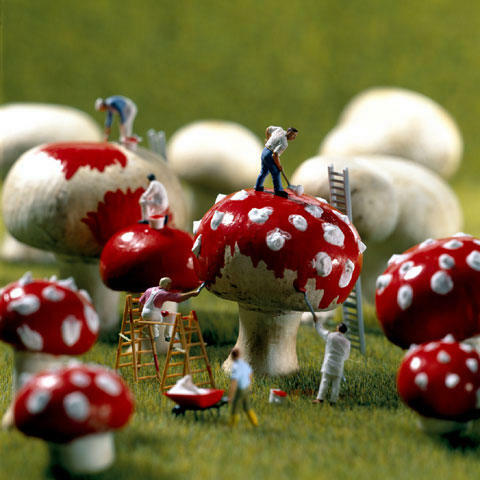 and does anyone remember the photographer who did the mini people like this but the landscape was a womans’s body?